I couldn't resist reading up a little on the show before we headed for Taunton tonight. There were, unsurprisingly, a number of blogs about the experience of being on the show. They broadly followed the same arc - and comfortingly all echoed our experience of being picked to be in the audience. Everyone who has seen the show has, at some point, wondered about this - especially if there appears to be a particularly weighted audience sometimes. But they are extremely careful to avoid accusations of bias and ensure a fair balance. This involved a call earlier in the week from the Producer who wanted a question on the spot, along with details of our work, voting intentions and political allegiances. One selected we were issued with an email to bring along with photographic ID. They are very careful that only the people who have applied and been selected show up - and an incursion of Badger Cull protestors on the site meant even more stringent measures tonight too! Once security checked we were ushered into a sports hall with large TVs showing the day's news and drinks on hand. Here we were asked to write out a second question, as topical as possible. A sheet of A4 also provided the credentials of the panelists tonight. Seeing Baroness Kramer on the list, I couldn't resist a question about railway franchising, but doubted it would get chosen as there were far more pressing events just now. As we chatted to neighbouring tables about questions a hush descended and suddenly I looked up to see David Dimbleby beside me. A little shorter than I expected, remarkably dapper and much jollier than his on screen persona, he talked us through the way the show worked. More than anything he stressed that this was our show - and our reactions and responses would be what made it happen and drove it forward. He was keen to ensure that we felt able to contribute and didn't let the politicians off the hook. Afterwards he also took a few questions from the audience, and managed to spin a few humours anecdotes from his twenty-year tenure on the show. Finally we were led - in small groups due to the badger people still being on site - over to the Tacchi-Morris Arts Centre. A fantastic new building which seems to have incredible facilities on hand, perfect for the show too with steeply raked seating and a generous stage area. Immediately I was struck by the set - that familiar backdrop and sweep of desks with the host town name curving around the front. Close up, it is much more clearly a kit of parts, TAUNTON spelled out letraset style and carefully placed on the stage front. The whole thing is reassuringly low tech - and as a bunch of audience members took the panel's seats for a practice debate, led by the dry witted and sharp Stage Manager, Stan, the camera men ducked and weaved to get the sweeping shots we see at the start of the show, their helped scurrying behind unravelling cable. The practice debate was surprisingly good fun, but seemed to go on for a while before things were ready. 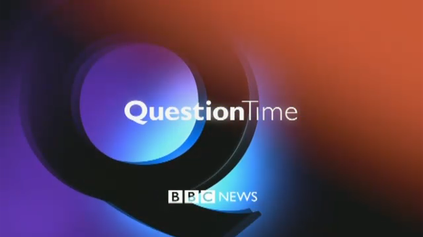 During this, all of the writers of the questions which the production team had selected were called forward and given a card with the question printed on it. They were also located in the audience for the sake of the camera crew, and returned to their seats looking not a little nervous! Rather suddenly, with Dimbleby back on stage and the panel queued along the stairs, we were ready! The recording is, rather amazingly, done in a single 59 minute long take. This perhaps explains the immediacy and the edge the show manages to maintain, and it also attests to the skills of the chairman! The first question is asked off camera to get everyone warmed up, and we were encouraged to get involved early. Then, once the link to BBC Glasgow - where the show is now based - was established, we were off. Dimbleby uttered his familar welcome, the camera men did their swoop around the set, and the theme music played. Straight into the first question about today's report on harsh penalties for drug possession, and already Owen Patterson is on the ropes. He admits he hasn't read the report at all and Dimbleby gently plays him on this. Suddenly I see a hand up next to me, and I realise my wife is about to speak. Dimbleby winks and nods that he's seen her. Time slows down. I'm suddenly aware of three million people out there later tonight. Patterson dodges her point about personal choice and relative harm, but not until he's fixed a steely glare on her for a moment for daring to question his Conservative principles. He dismisses it with a glib point about "dangerous drugs" but Dimbleby pushes it home "What about alcohol she said?" Patterson squirms into a point about it being OK for well-off middle class people to take drugs because they have the resources to deal with the issues. It sounds bizarre as delivered - and I think he meant to speak about the disproportionate burden on disadvantaged communities, but this opens up a frankly odd debate on things. It's left to two unlikely champions to bring things back on track - Caroline Lucas of the Green Party who talks eminent sense on policy, and author Anthony Horowitz who presses the point on this being a public health issue, not a criminal justice one. With our brief moment in the spotlight complete, I relax into the debate. While Owen Patterson manages to shift each response from a reasonable start into a weird, ill-informed finish, Tristram Hunt fares little better. He simply cannot resist the urge to make party political points from even the most unlikely material, and when challenged he faces the audience with knitted brows and a strange disbelieving gurn which turns him into a rather pompous public schoolboy figure. This is all played out particularly on a question about the EU's demand for £1.7bn - which Baroness Kramer dismisses as something which won't be paid and will blow over. Hunt decides to try to blame the Government for not knowing it was coming up. Almost everyone points out that it was the last Labour government who signed the terms. Hunt persists, claims that the deal is secret and only the government can know the details. It's bizarre and almost uncomfortable to watch in person. The stars of the night clearly remain Lucas and Horowitz, who stay on track, don't stray into ill-informed speculation and manage to mostly avoid party lines. Baroness Kramer comes in a close second - smart, well-read and reasonable. The two boys from the big parties come across as hired help - dull-witted and easily led into foolish speculation. It's not a good night for the mainstream perhaps. All too soon the hour is up and we're filing out into the darkness, badger protesters still yelling. In an hour, the show will be beamed across the country, streamed across the globe and just for an hour, we'll be part of that again. The team that does this, almost every single week of the year, manages to keep it fresh and interesting, balanced - mostly - and representative. It's a pretty amazing feat. The logistics owe more to a touring rock band than a TV show, and that this happens again and again, almost always without hitch is testament to the behind-the-scenes crew too. I left thrilled to have been involved despite my question not being asked, and if possible even fonder of this British TV institution.